I felt so bad last night because EJ bonk his head at the end table of his sister's bed room. He was watching his movie on the small DVD player and I think he got tired from sitting at the side of the bed so he tried to lay down to get comfortable but he did not calculate the distance of the table to his head. 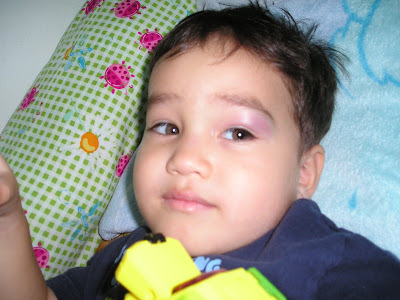 The result of the accident......a BLACK EYE. My poor little boy got a shiner on his left eye.